In 1908, people sung with great joy about eating peanuts and Cracker Jack at a baseball game. If you put all those people in a time machine and sent them to the present day, they’d be shocked and amazed at how far concession food has come in the last hundred years, what with custom-made ice cream sandwiches, meat-free cheesesteaks that taste like the real thing, and $26 burgers. Granted, they’d probably also be floored by the concept of television, but the point still holds! And this year, the food at MLB stadiums around America is better than ever, with outrageous, over-the-top eats you’d be silly to pass up. 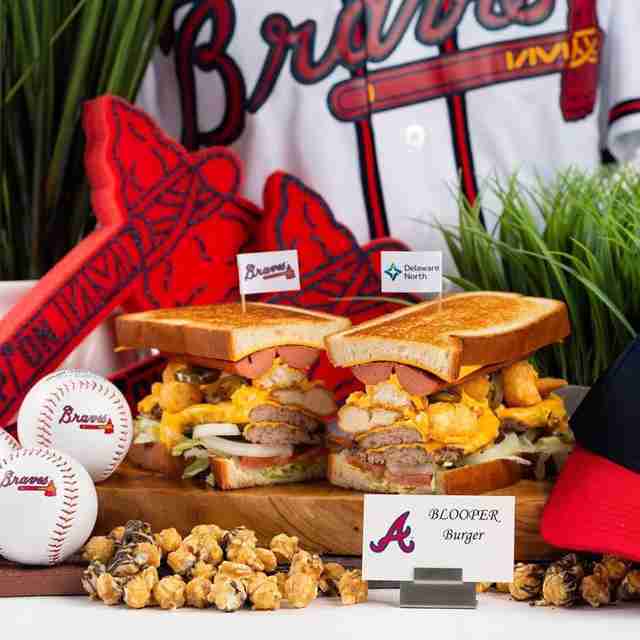 Here’s all the best new food debuting at ballparks this season. 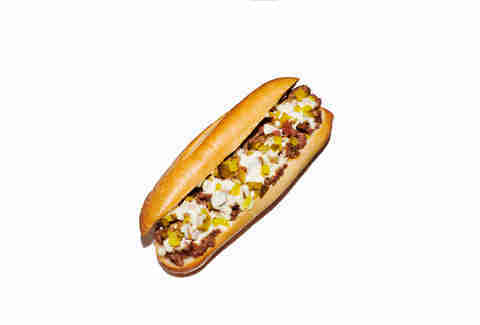 America’s favorite drummer/DJ/food enthusiast teamed up with the folks behind the realest fake meat ever made at Impossible to create a dish worthy of a baseball game: a classic cheesesteak where everything is real but the steak. While vegans will have to wait a little longer for a version with non-dairy cheese, everyone else can enjoy this faux cheesesteak topped with liquid cow’s gold and served on a real-deal Amoroso’s roll. If you can’t make it out to a home Phillies game this season to witness Bryce Harper’s power at the plate (go Phils! ), it’ll also soon be available at select Live Nation concert venues. It’s called a Blooper Burger, but you won’t be committing an error by buying one. Was that joke too inside baseball? (Sorry.) Here’s what $26 gets you: four cheeseburger patties, a footlong dog, chicken tenders, jalapenos, and cheese sauce on Texas toast. It's named by the Braves' embattled new mascot. The best part is you can probably cut it into four pieces with your pals and be full. Because baseball and beer are fine bedfellows, you’re practically required to wash it down with a Terrapin beer, especially since the brewery has a taproom on site with small batch brews. Despite winning a World Series title only a couple years back, the Royals couldn’t even get to 60 wins last year. And that can only mean one thing for fans of the long-suffering squad: the longer you focus on eating concession stand food, the less time you have to watch the team on the field. 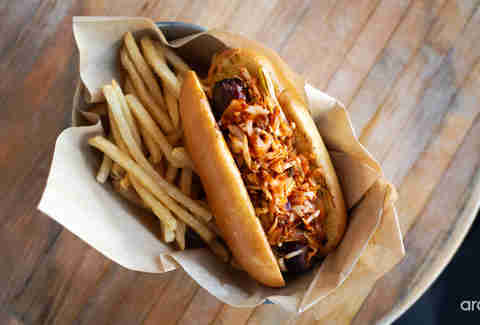 This new Korean BBQ-themed kielbasa certainly gives everyone at The K a lot to ponder, what with a meaty, smoked pork kielbasa topped with BBQ sauce and a daikon kimchi slaw. New York baseball fans have an embarrassment of riches when it comes to ballpark food. The Mets’ Citi Field famously has a Shake Shack, David Chang’s spicy chicken sandwich spot Fuku, a Danny Meyer-owned pizza joint, and a depressingly long list of players on IR. Sorry, Mets fans. But it’s hard to argue Yankee Stadium isn’t taking a step in the right direction with a burger from the urban winemakers at City Winery that screams class. Ballpark Digest reports that the namesake burger is topped with bacon, pinot noir red onion jam, and goat cheese. Which begs the question: if your burger’s red onion jam isn’t made with pinot noir...is it truly worth eating? 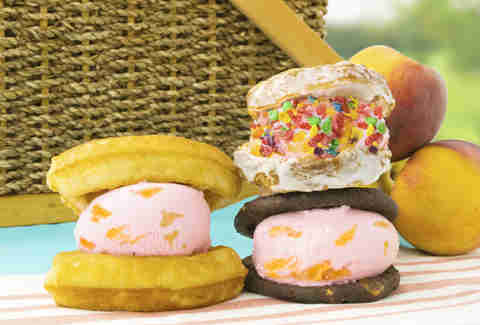 Peaches are the MVP of the summer fruits, and Cream -- the venerable make-your-own ice cream sandwich makers at Oracle Park -- has a new flavor to harness all that delicious limited-time fruit: Pink Peach Bellini ice cream. Sadly, it lacks booze, but it makes up for it with a fizzy, champagne-flavored ice cream packed with real peaches. Even better, you can elevate the dessert by slapping a few scoops in between the cookies of your choice (butter cookies sound hella good to us) or soft, pillowy waffles. If you simply cannot live unless you’ve had booze hidden in dessert, head across the Bay to the Oakland A’s stadium and look for Party Pop, which sells vodka and bourbon-infused ice pops from an oversized tricycle. We weren’t kidding: the quinoa blueberry salad is a new item Pittsburgh’s PNC Park, and it features red quinoa, hearts of palm, and a balsamic dressing. Eating healthy is a good bet long-term, but outside of Vegas buffets and steakhouses, ballparks are one of the few acceptable places to gorge like a particularly gluttonous king. Plus, you think that quinoa salad would fly in Texas? 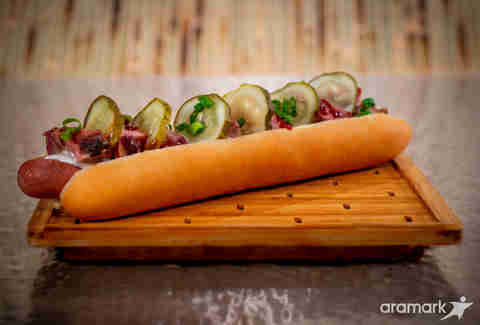 Astros fans instead will get to revel in the team’s ridiculously talented lineup and a new handheld dinner featuring a Nolan Ryan all-natural Texas beef dog, smoked pork burnt ends, cheese sauce, pickle chips, and a hot BBQ sauce. Tater tots are the perfect ballpark food -- one, because they’re delicious, salty, carb-filled morsels, and two, because you can easily pop them into your mouth while you ready your other hand to barehand a foul ball like it’s nothing. These are not your average tots, as Pirates fans will be enjoying them covered in cinnamon chipotle spiced pulled pork, onions, and slathered in a chipotle maple syrup. Also new to PNC is a strange dinner/dessert hybrid called the Pittsburgh cone, named thus because it stuffs kielbasa, pierogi, Swiss, sauerkraut and Russian dressing into a waffle cone. Someone is definitely catching a foul ball in that waffle cone this season. Move over chicken, there’s a new tender in town. 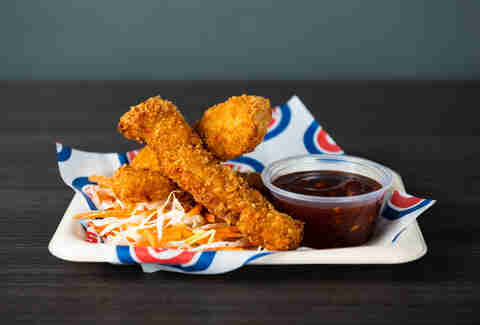 According to Time Out Chicago, ballpark concessionaire Levy Restaurants wasn’t satisfied with breading a few slices of pork and calling it a day -- it’s serving those pork tenders with a unique Japanese BBQ sauce and a slaw made from cabbage and carrots. This isn’t the only new pork dish served at the Cubs’ legendary home: there’s also a crispy pork sandwich served on a pretzel bun with pickles and dijon. Even better, this year Cubs fans can pair those sandwiches with 3 Floyd’s beer.